The 4th Graders did a great job with their Women in History project. The 4th Grade’s Women in History cross-curricular project is amazing and so are the #leadingwomen in the Class of 2027! 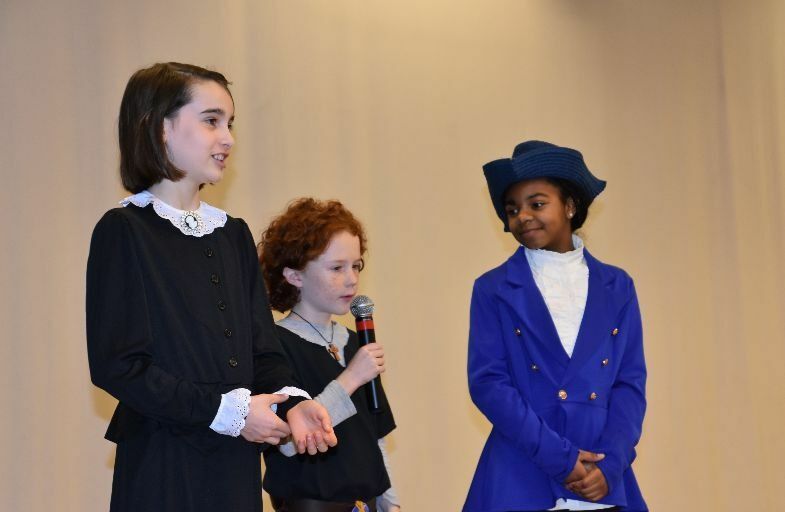 Joan of Arc, Malala Yousafzai, Hillary Clinton, Mary Tyler Moore, Michelle Obama, Serena Williams and Frida Kahlo were just several of the women portrayed in the 4th Grade's Women in History presentation. The girls embarked on a long term, multi-step, cross-curricular project that involved researching and writing about an influential woman in history. Girls in the Class of 2027 researched and then wrote their own books about their chosen characters. They used mentor biographies as models to choose a style of reporting that complemented their personal writing style and that best fit their chosen subject. Each girl represented her historic woman on stage, and the audience had the opportunity to guess each character. In addition, the girls were divided into small groups and developed skits with a setting and a plot that incorporated all of their different women characters. Visitors were able to view the girls’ artwork and biography books. Here’s a sneak peek of the girls’ performance, I am Woman.